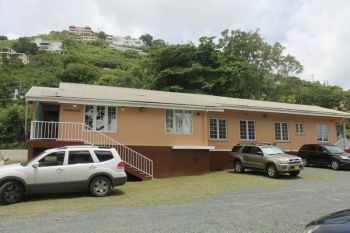 You are here: Virgin Islands News Online » News » Was gun planted by police @ ‘Letty’ Hodge’s property? Was gun planted by police @ ‘Letty’ Hodge’s property? ROAD TOWN, Tortola, VI – As the trial of Mrs. Violet ‘Letty’ Hodge and Mr Lucien Smith got underway in the Magistrate’s Court Mrs. Hodge’s Attorney, Mr Julian Knowles. QC, had cause to question one of the Prosecution’s witnesses as to why he did not record certain information in his handbook and why the same information was neither in the statement that is part of the trial. 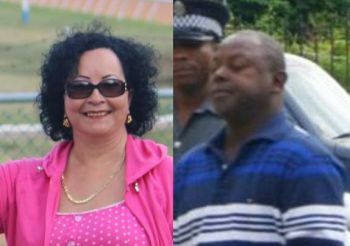 The information that Mr Knowles was referring to yesterday January 21, 2015 was that which referred to a key investigating police officer allegedly telling Mrs Hodge that a gun was in a deep freezer in a house belonging to her to which she had responded, “Never”. It was during cross examination of the investigating officer that Mr Knowles took him back to the earlier evidence of him taking Mrs Hodge to another of her properties which was at Frenchman’s Cay, to fulfill part of their ‘Operation Bassette’. The court heard from Mr Knowles and confirmed by the Police Officer witness in the box at the time that during the operation he was part of a team that descended on the home of Mrs Hodge in the early morning hour of August 24, 2011 where forced entry to the house was executed. The Police witness admitted to the court that the glass door of Mrs Hodge’s home was shattered by the police officers resulting in her being very scared, confused and upset at the time. Part of the events of that morning saw her having to walk through heaps of broken glass to get to the officers to find out what was going on. The witness told the court that the usual processes in such investigations were followed as they searched the accused home, collected a number of items, mainly documents, and then he proceeded to transport her to another house belonging to her at Frenchman’s Cay. By the time that officer had gotten there with Mrs Hodge, there were other police officers already at her Frenchman’s Cay property and it was upon her arrival, even before the official search of the Frenchman’s Cay home started that another police officer indicated to her that there was a gun in a deep freezer in the house. That was a key point of note by her attorney. The questionable gun was admitted into evidence in the court yesterday and was shown to all involved where the serial number was removed. The court also heard that the Frenchman’s Cay house was found open and when investigating officers questioned why that was so Mrs Hodge allegedly told them that the keys were lost, no one lived there and that the building was basically being used to store things. The witness said that the house had lots of old things among them were outdated bank documents and appliances from a restaurant which Mrs Hodge had that was closed. Other points of note that were put to the police witness were the question whether any female police officer/s were present during the arrest of Mrs Hodge to which the witness said he cannot recall and the presence of police officer/s from the USA being at Mrs Hodge’s Frenchman’s Cay property on the morning of August 24, 2011, but was not in a witness’ notes or a particular document that formed part of the trial. On the other hand as it relates to Mr Lucien Smith being arrested another police officer of the Royal Virgin Islands Police Force’s (RVIPF) Drug and Violent Crime Task Force told the court that he was instructed along with another, to proceed to the workplace of Mr Lucien Smith to carry out a warrant. He was taken to the Road Town Police Station and placed in a holding cell and later that day an audio/video interview was done with the accused Smith. The police officer was asked the where the workplace of Mr Smith was and he said it was in Sea Cow’s Bay but he failed to say what type of business it was and the name of the workplace. Today the trial continues in the Magistrate’s Court when some ‘high profile’ witnesses are likely to testify via video link. On Tuesday when the trial got off to a start Ms Tiffany R. Scatliffe, Principle Crown Counsel, attempted to have the Magistrate agree with her to have portion of the trial heard in-camera. Attorney Knowles found that to have been the strangest request ever as in all his career he has never heard of or witnessed such an event. He however advised of certain mechanisms that can suffice to quell the fear of the witnesses. This news site understands that the witnesses are not locals but are persons who are or have been involved in risky activities. The duo is accused of conspiracy to allegedly import drugs; acquisition, possession or use of proceeds of criminal conduct; keeping a prohibited firearm; and unlawful possession of explosives. Smith is charged separately with possession of cocaine with intent to supply the illicit drug. A joint operation between the Royal Virgin Islands Police Force and U.S. law enforcement authorities on September 29, 2010 led to the alleged seizure of eight bales of cocaine totaling over 260 kilos on the south side of Norman Island. It is alleged that two of the boats used to pick up the cocaine were registered to Smith. The Romney Park resident was then slapped with charges for conspiracy to import cocaine, importation of cocaine and unlawful possession of cocaine with intent to supply. REALLY? Guns were not planted, they were always and already there. It's not over until it is over. When ever these types of allegations are heard in court, it's always good news for the prosecution. It usually means that the evidence is strong, and there is little to challenge. It's a cheap trick which makes me smile. "smile" you guys need to be relax a little and stop running scared. Legalize the weed so everyone can legally eat a food.